That about sums it up for the Fantasy Golf Report's season to date. Or maybe a more appropriate quote would be, "Do you know what's going on here? Can't you see what's happened? I've become George!" - Elaine Benes, Seinfeld. (This is where you're supposed to respond with "don't say that"). In the five tournaments since the Northern Trust, my picks have accumulated $263,540 in earnings. While you might say that's not THAT bad, you would be ignoring the fact that two of those tournaments were WGC events where everyone gets paid so, for those, you mathematically would have had a better chance at success had you just assigned a golfer to every tree in your backyard and then gone with the first two your dog pissed on. The latest debacle was Justin Rose's missed cut last weekend when he backed-up a relatively solid opening 71 with a slap happy 79 on Friday. I should have know I was in trouble when Rose posted this video of himself on Instagram hitting balls on the range Thursday afternoon because there is no speedier route to a missed cut than releasing footage of yourself hitting range balls while your adoring fans scramble for the Jergens and Kleenex. I mean good lord look at some of those comments. "Such good balance and rhythm." "Going low tomorrow." And my personal favorite, "Wooow" from the most easily impressed man in the world - what does he do when Rose hits a great shot on the actual course . . . jump out of his Barcalounger and start singing You Are So Beautiful in his Joe Cocker voice? Get a life people (wrote the unpaid fantasy golf blogger). Now to make matters worse I have absolutely no feel for who to pick at Augusta in a few weeks. In the preseason I had Tiger (back), then switched to Jason Day (thumb), then I mulled Bubba (flake) and finally I figured I could go with the old standby of Adam Scott but he coughed-up a hairball of a round on Sunday with some very suspect putting and handed the Arnold Palmer Invitational to Matt Every. That leaves Rory (head), Phil (judgment) and Dustin Johnson (psycho fiancee) as the next best options. Yikes. I guess there's always Angel Cabrera. 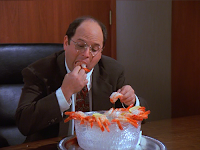 To bust out of this funk I'm pulling a mild Costanza for the next two weeks. Instead of posting the previews on Tuesdays, I'm doing them on Mondays WITH NO PICKS FROM THE LIST OF FAVORITES!!!. And no analysis, footnotes or any of that other crap that's gotten me nowhere. Just a list of five players with names I can picture on the leaderboard when I close my eyes and almost fall backwards in my chair (now if I can just make that a visual of the Sunday leaderboard instead of the Thursday leaderboard). The only thing I'm not changing is the pictures. I mean, I'm not dead inside. Yet. Email the Fantasy Golf Report at fgr@fantasygolfreport.com . . . or don't. Your call.